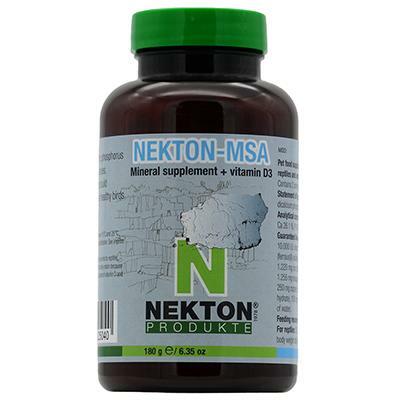 NEKTON-MSA is a high quality mineral blend supplemented with vitamin D3, major/trace elements and amino acids. NEKTON-MSA supports and powers the metabolism and bones, prevents rickets, activates mineral conversion and helps to compensate for the damage caused by calcium deficiency. NEKTON-MSA covers the increasing need for minerals in breeding/rearing, protects against malabsorption, increases defense against infection and prevents fragile eggs in birds. NEKTON-MSA supports good development of bone structures in young animals. It is especially important for your animals for preventing later diseases caused by a deficiency of vitamins and minerals. For reptiles: 0.25 g NEKTON-MSA per kg of body weight daily, or respectively 1.5 g once a week. Suitable for dusting over the food/live feed. For birds: 1 g NEKTON-MSA per kg of body weight daily, mixed with soft food or with bird feed depending on the type of feed. Not soluble in water, level measuring spoon inside holds 1.5 g NEKTON-MSA. We offer special NEKTON vitamin and mineral compounds for dogs and cats. NEKTON-MSA should be stored dry and out of sunlight, between 15° and 25° C (59° and 77° F). DO NOT STORE IN THE FRIDGE !! !